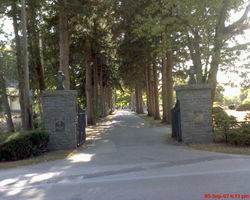 St. Paul's cemetery is located on Hersey Street in Hingham. St. Paul Parish is in the process of improvements and expansion of the St. Paul Cemetery on Hersey Street to be accomplished over a five-year period. During the calendar year 2017, the Cemetery Committee engaged a cemetery architect, Ricardo Austrich of Halvorson Design in order to evaluate possible changes to the cemetery over the next four years. This consultation resulted in a number of improvements and expansion steps to be implemented over the course of the next few years. Among these updates to date have been parking areas added to Section R, roadwork improvements, landscaping clean up, various fence repair and replacements. Most prominent is the removal of the chain link fence along Hersey Street which will be replaced with a durable, historical iron fence by spring. NOTICE: The water at St. Paul's Cemetery will be shut off for the winter and will remain off until Spring. Please collect your hoses and store them for the winter. Thank you for your cooperation!! as part of his Eagle Scout Project.